Today we remember the Parents of the Virgin. In the Holy Scriptures we see nothing of them, but surely they existed as all parents do. There is an early but unreliable document, known as the Proto-Gospel (or Proto-Evangelion) of James, that calls them Ann and Joachim, and the Church customarily has referred to them by these names. It is easy to forget but just think, these people had a huge influence on their daughter, the Virgin Mary. Remember how she humbly submits to God's will? Surely she learned this attitude from her family, esp. her mom and Dad. I think that is a wonderful tribute to them, and any parent should be proud to have such a child. Almighty God, heavenly Father, Who set the solitary in families: We thankfully remember before You this day the parents of the Blessed Virgin Mary, and we humbly entrust to Your never-failing care the homes in which Your people dwell; that we may be made true members of the heavenly family of Your Son Jesus Christ, Who lives and reigns with You and the Holy Spirit, one God, now and ever. Amen. Mary Magdalene is mentioned in the Gospels as being among the women of Galilee who followed Jesus and His disciples, and who was present at His Crucifixion and Burial, and who went to the tomb on Easter Sunday to anoint His body. She was the first to see the Risen Lord, and to announce His Resurrection to the apostles. Accordingly, she is referred to in early Christian writings as "the apostle to the apostles." The Evangelists point out that among those standing at the cross were also the mother of the Apostle James the Less, and Salome, and other women followers of the Lord from Galilee itself, but all mention first Mary Magdalene; but the Apostle John aside the Mother of God, names only her and Mary Cleopas. This indicates how much she stood out from amidst all the women gathered round the Lord. She was faithful to Him not only in the days of His Glory, but also at the moment of His extreme humiliation and insult. As the Evangelist Matthew relates, she was present at the burial of the Lord. Before her eyes Joseph and Nikodemos went out to the tomb with His lifeless body; before her eyes they covered over the entrance to the cave with a large stone, behind which went the Son of Life. Tradition testifies, that when the Apostles departed from Jerusalem for preaching to all the ends of the earth, with them also went Mary Magdalene to preach. A daring woman, whose heart was full of reminiscence of the Resurrection, she went beyond her native borders and set off to preach in pagan Rome. And everywhere she proclaimed to people about Christ and His Teaching, and when many did not believe that Christ is risen, she repeated to them what she had said to the Apostles on the radiant morning of the Resurrection: "I have seen the Lord!" With this preaching she made the rounds of all Italy. 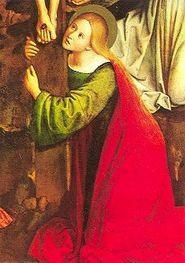 Tradition relates, that in Italy Mary Magdalene visited the Emperor Tiberius (14-37 AD) and proclaimed to him about Christ's Resurrection. According to tradition, she took him an egg as a symbol of the Resurrection, a symbol of new life with the words: "Christ is Risen!" Then she told Tiberius that, in his Province of Judea, Jesus the Galilean, an holy man, a maker or miracles, powerful before God and all mankind, was executed on the instigation of the Jewish High-Priests and the sentence affirmed by the procurator Pontius Pilate. Tiberias responded that no one could rise from the dead, anymore than the egg she had brought could turn red. The egg turned red immediately, as testimony to what Mary was preaching. Thanks to Mary Magdalene the custom to give each other paschal eggs on the day of the Luminous Resurrection of Christ spread among Christians over all the world. Mary Magdalene continued her preaching in Italy and in the city of Rome itself. Evidently, the Apostle Paul has precisely her in view in Romans 16:6, where together with other ascetics of evangelic preaching he mentions Mary (Mariam), who as he expresses "has done much for us." Evidently, she extensively served the Church, being exposed to dangers, and sharing with the Apostles the labors of preaching. Tomorrow I bury one of my favorite uncles. He lived a good life, was an honorable man, a man of deep and strong Faith in Jesus. This peaceful post from Sr. Ellie helped me to think incarnationally and how Jesus Christ is always with us. How now He is with me, and with my uncle and is the Connection between the two of us. In this invocation, the Presence of Christ wraps us like a seamless garment. So here we find the the mystery of the incarnation in our own lives, and the lives of all around us. Eternal God, in Whose perfect kingdom no sword is drawn but the sword of righteousness, no strength known but the strength of love: So mightily spread abroad Your Spirit, that all peoples may be gathered under the banner of the Prince of Peace, as children of one Father; to Whom be dominion and glory, now and for ever. Amen. Most of my life I have been surrounded by Christians. Rarely have I found myself in the minority spiritually, however it has happened a few times. So, one would think that as followers of Jesus Christ, the Prince of Peace, we would be the most peaceable people on the planet. Clearly we are not. The world is currently being swallowed up in horrible violence, and we are the vanguard of the Kingdom of Heaven. The question is, how can we show the way? I would submit that the way of violence, jihad, revenge, judgment, and inquisition is the easy path, the dangerous path, the lower path, and most importantly the evil path. Jesus has shown us the way: "Love your enemies, do good to those who hate you, bless those who curse you, pray for those who mistreat you", we must listen to Him and cut through the testosterone laced rhetoric and stop hate and revenge. No one said being a Christian was easy. †Merciful and loving Father, We ask You with all our hearts to pour out upon our enemies, with bountiful hands, whatever You know will do them good. Chiefly, we ask You to grant them sound and uncorrupted minds so they may know You and love you in true charity and with their whole hearts, and love us, Your children, for Your sake. Do not let them do themselves harm by becoming angry at us. Let them see that we are doing for them the best we are able. Lord, we ask for their change of heart as well as for our own. Do not drive them away from us by punishing them. Rather, join and knit them to us through Your mercy. And since we are all meant to join You in Heaven, let us begin to live together peaceably on earth, so that we may come to You one day in the love exemplified by Your Son, our Savior, Jesus Christ. Amen. I often hear of people talking about God being a God of Justice. My blogging friend Bruce has a wonderful post which I will include below. Very thought provoking. Many people say that Jesus changed how God acted in the Hebrew Scriptures.. perhaps not. Some Christians like to make a distinction between "Old Testament justice" and "New Testament mercy," as if God's character changed at Jesus' crucifixion. It is a covenant of the Creator’s righteous justice—or judgment—under the Law! The Covenant of Law and the principle of judgment (or justice) under the law, therefore, applies to every nation, to every government, and to every people. In this point of view, justice is the opposite of the mercy that God showed when Jesus gave his life on the cross. But that's not the way the word justice is used in the Hebrew Scriptures. In the Isaiah passage I quoted above, the opposite of justice is "the bonds of injustice" or the "yoke" of oppression. Justice means to share our bread with the hungry, to "bring the homeless poor into [our] house," to cover the naked. and bow myself before God on high? with ten thousands of rivers of oil? and righteousness like an everflowing stream. Give the king your justice, O God, and your righteousness to a king’s son. May he judge your people with righteousness, and your poor with justice. May the mountains yield prosperity for the people, and the hills, in righteousness. May he defend the cause of the poor of the people, give deliverance to the needy, and crush the oppressor. When you make your neighbor a loan of any kind, you shall not go into the house to take the pledge. You shall wait outside, while the person to whom you are making the loan brings the pledge out to you. If the person is poor, you shall not sleep in the garment given you as the pledge. You shall give the pledge back by sunset, so that your neighbor may sleep in the cloak and bless you; and it will be to your credit before the Lord your God. You shall not withhold the wages of poor and needy laborers, whether other Israelites or aliens who reside in your land in one of your towns. You shall pay them their wages daily before sunset, because they are poor and their livelihood depends on them; otherwise they might cry to the Lord against you, and you would incur guilt. You shall not deprive a resident alien or an orphan of justice; you shall not take a widow’s garment in pledge. Remember that you were a slave in Egypt and the Lord your God redeemed you from there; therefore I command you to do this. When you reap your harvest in your field and forget a sheaf in the field, you shall not go back to get it; it shall be left for the alien, the orphan, and the widow, so that the Lord your God may bless you in all your undertakings. When you beat your olive trees, do not strip what is left; it shall be for the alien, the orphan, and the widow. When you gather the grapes of your vineyard, do not glean what is left; it shall be for the alien, the orphan, and the widow. Remember that you were a slave in the land of Egypt; therefore I am commanding you to do this. If you lend money to my people, to the poor among you, you shall not deal with them as a creditor; you shall not exact interest from them. If any of your kin fall into difficulty and become dependent on you, you shall support them; they shall live with you as though resident aliens. Do not take interest in advance or otherwise make a profit from them, but fear your God; let them live with you. You shall not lend them your money at interest taken in advance, or provide them food at a profit. I am the Lord your God, who brought you out of the land of Egypt, to give you the land of Canaan, to be your God. So, in a sense, the folks at Renew America are right: The God of the Hebrew Scriptures is a God of justice. But when the Scriptures speak of justice, they mean social justice. God cares deeply about the poor and the oppressed, and expects us to treat them fairly. It seems to me that, from a biblical perspective, justice and mercy are the same thing. Sometime near the year 480 A.D. a man was born in Nursia, Italy that history knows as St. Benedict. His chief biographer, the Patron of my Order, St. Gregory the Great doesn't really focus on the when of his life, but on his Rule, the greatest foundational document of western Monasticism. 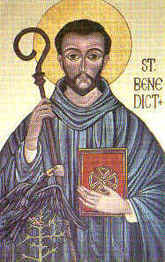 Benedict's parents sent him from his village up in the mountains north and east of Rome to receive an education in the classics in the city. As he was following his studies, he found life in the eternal city to be simply too degenerate to tolerate and he left for Subiaco and lived as a hermit for about three years. During this time, he was in contact with some of the local Monks there, esp. one named Romanus. During this time as a solitary, he was discovered by a group of Monks who prevailed upon him to become their spiritual leader. His regime was too strict for these lukewarm Monks, and under a cloud of attempted murder, Benedict left them behind and founded 12 other Monasteries, including the Mother House of the Benedictine Order, Monte Cassino. He destroyed a pagan temple to Apollo and built his Monastery on that site. Benedict drew up a rule of life for Monks. This Rule, which he called "a school of the Lord's service, in which we hope to order nothing harsh or rigorous” was the most important thing he ever did. He wasn't known as a great scholar, but he was known as a man after the Lord's heart and a leader of Monks. His Rule gives instructions for how the monastic community is to be organized, and how the monks are to spend their time. Many Monks were very unbalanced in his day, some lax, and others so rigorous as to be unhealthy. Benedict's Rule seeks balance between work, prayer and rest. Under his direction, an average day includes about four hours to be spent in liturgical prayer (called the Divine Office), five hours in spiritual reading and study, six hours of labor, one hour for eating, and about eight hours for sleep. This model continues today in most western Monastic communities. The Book of Psalms is to be recited in its entirety every week as a part of the Office. A Benedictine monk takes vows of "obedience, stability, and conversion of life." That is, he vows to live in accordance with the Benedictine Rule, not to leave his community without grave cause, and to seek to follow the teaching and example of Christ in all things. My Order, the Gregorians grew out of the Benedictines. There is no way of knowing the total effect of the monastic movement. The Benedictine order and of similar orders that grew out of it, have changed the western world. We owe the preservation of the Holy Scriptures and other ancient writings in large measure to the patience and diligence of monastic scribes. In purely secular terms, their contribution was considerable. We have to recall that during this time, Italy and the entire Mediterranean world was falling back into barbarism. 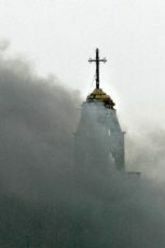 The Church was torn by conflict, city and country alike were made desolate by war and pillage, and violence was rampant among Christians as well as heathen. St. Gregory presents Benedict as the model of a saint who flees temptation to pursue a life of attention to God. Through a balanced pattern of living and praying Benedict reached the point where he glimpsed the glory of God. His simple Rule has affected Christianity in the western world more than the writings of most Clerics. Almighty and everlasting God, Whose precepts are the wisdom of a loving Father: Give us grace, following the teaching and example of Your servant Benedict, to walk with loving and willing hearts in the school of the Lord's service; let Your ears be open to our prayers; and prosper with Your blessing the work of our hands; through Jesus Christ our Lord, Who lives and reigns with You and the Holy Spirit, one God, for ever and ever. Amen. A lot of people are in a turmoil in the Anglican Communion these days. The progressives point out the bald faced power politics played by the right, the conservatives point out the fuzzy thinking and rushed agenda of the left. What is the end of all this? Are hoards of unchurched people pouring into the "Continuing", conservative Anglican churches? Hm. Not that I see. Are hoards of people pouring into the Mainline Episcopal Church? Not that I see. But is that a problem? What is the real point here? Is it to save our ancestral worship that we are comfortable in, our vestments, incense, male (presumed straight) Bishops OR is the point to worship Christ and Him crucified? To invite others along side to do the same, and to reach out in His name to all who enter our door or cross our path. It doesn't matter if we follow the "faith once delivered" if our youth refuse to attend. Be attractive, be like Jesus, Who lived among sinful people yet drew them to Him. That will draw people to Him, not our Church, because after all, I think people can tell when we are following causes and not Christ. 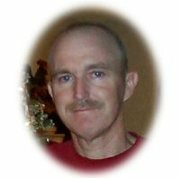 It has been three months since my younger brother died. I want so much to pick up the phone and call him, but I can't. He isn't there. I know, I held his hand as he left this world. I remember the companion of my childhood. How we used to run through the fields of the family farm, getting into trouble, fighting, talking about girls. I was so proud of the man he grew up to be. How he was faithful and true to his one and only wife. How he loved and cherished his daughter. I rememeber his constant support during the time my own wife was dying. When I could not even stand as I left her deathbed, he was there holding me up. He drove me home to my kids. There hasn't been any major life event where he wasn't present. The void is palpable. I am so thankful to God for the redemptive work of Jesus. For now I am not without comfort. I know that my brother is in the nearer Presence of God. I know that beholds Jesus in God's heavenly dwelling place. I know that his heart and soul now rings out in joy to his Maker.